This year, one of the General Committee’s objectives is to support the Harbour Conservancy’s drive to improve recycling and reduce waste. So this summer, the House Committee took steps to reduce and recycle waste products generated from the galley and bar. These are mostly generated during sailing events and our wonderful social activities. Installed at the clubhouse are three new recycling bins with details for sorting exactly the products which can be recycled. Why three you ask when all the waste gets thrown together in the end? Well, unless the waste is the right material and clean, it will contaminate everything and make all the waste unsuitable for recycling. These small bins can easily be tipped into our new council recycling bin for collection. Although there are other items capable of being recycled, the aim is to start with the basics and endeavour to do them well. The club now has a large council recycling bin on the quayside. 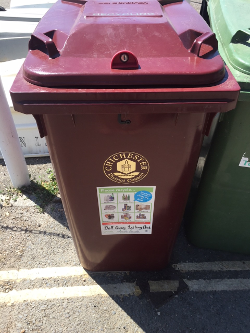 This beautiful burgundy bin is a dedicated club bin and is locked so the public cannot contaminate it with rubbish. This means we are successfully recycling a huge amount of club waste products. The next step underway is looking to devise and implement schemes to reduce the amount of waste products. During Junior Week in August, several pilot schemes were successfully tried. The Juniors were asked to bring in their own plates and cutlery and take them home to wash. This vastly reduced the use of throwaway paper plates and plastic cutlery. The club now have a set of reusable water bottles to encourage less use of single-use plastic bottles. We are looking to roll out more initiatives like this across the club activities. We hope all our members will be as supportive as the children were at Junior Week. They were great and set an example to all club members to recycle and reuse. Items need to be clean, dry and loose. Mixing unclean or excessively wet items renders the bin’s contents unsuitable for recycling and can lead to the imposition of a fine and the non-collection of the waste. 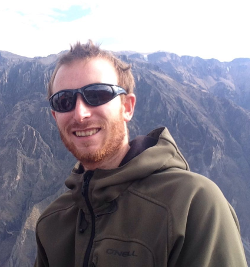 my name is Chris Pritchard and I have recently been appointed the Dell Quay Sailing Club Environmental contact. My girlfriend Katie and I have been members of DQSC since February and have a cruiser which goes by the name of Wave Dancer. Throughout Chichester harbour there is a drive between sailing clubs and businesses to reduce our impact on the environment in and around the harbour. This can include litter, recycling, pollution and the use of plastics. You may have already noticed the recycling bins by the galley, implemented by Clare Rose our in-house Environmental officer. This is a great first step towards our goal. 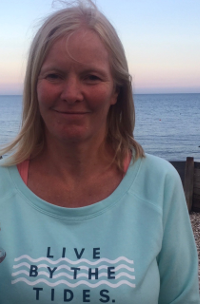 I moved to Chichester from London last year and joined Dell Quay Sailing Club. I had some sailing experience having raced GP14s at the Welsh Harp, London. Initially, I tried out most of the club boats but now have use of a Mirror although I am alway happy to crew too. When my daughter was at school she did a project on recycling and even though she is grown up I feel it's important to carry on what she taught me. I love the beautiful area we live in and want to concerve it for others to enjoy in the future. Our newest campaign, #2MinuteBeachClean, is located at Dell Quay. From the Beach Clean Station anyone can take a used bag and litter picker, to use while enjoying a walk along our coastal path. 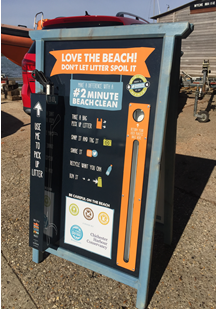 At the end you can simply empty the litter into our Dell Quay bin and return the grabber to the board. We also have a few other ideas including bike racks, encouraging people to cycle down to the sailing club. Now I would like to request your ideas on how DQSC can reduce its environmental impact with small schemes that create the greatest gains. I’m not looking for anything too drastic to start with! Any ideas can be jotted down on the club notice board.